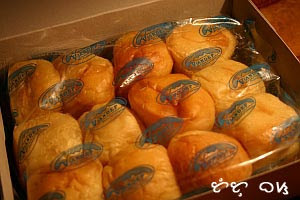 Recently, Tutubi was able to buy a box of pastel buns with filling, a reminder of his memorable and captivating island of Camiguin travel in northern Mindanao in May 2003. These pastrylicious pastels used to be not available in Manila but now can be bought at Shopwise Department stores and Market! Market in Taguig City. Have yet to see them in Greenhills and SM though. ang favorite kong pasalubong ay pastillas de leche at yung jumbo type ng cornik, i think popcorn din tawag dun. My pasalubong to friends: Pili nuts from Bicol! But those Pastels look good! I like the peanuts from Iligan. I love those Pastels too. My father buys them whenever he visits Cagayan De Oro (yup, they're sold there too). I just don't like those Durian variants. masarap yung chocolate flavor =)may vjandep pastel sa SM.. SM davao hehehe =P another heart-stopping (literally) pasalubong from cagayan de oro is sler's chicharon. for me, better than the famous chicharon of carcar (cebu). favorites? marami.. bagnet ng ilocos, marang ng cotabato, bongbong's broas from negros, at seafoods from gensan, to name a few. halatang matakaw! masarap talaga mamasyal sa Pilipinas kasi bawat lugar, may kanya kanyang produkto. hindi lang mata ang busog, pati tiyan. carlotta, pastillas of bulacan is the best for me so far. chichacorn of ilocos? tani, the first time i saw them was in CDO, yes. durian aversion, heh? my favorite pasalubong from the philippines is dried squid even though my husband and children think it smells horrible. i would just lit up some candles to help absorb the smell in the house. sarap kasing isawsaw sa sukang may labuyo. my choice of pasalubongs are pastillas and peanut brittles. Thank u very much for the tip. 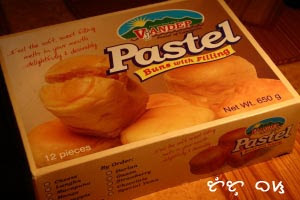 I really love those pastel from Camiguin. Truly sinfully delicious!!! My friend from CDO once shared this pastel with me- and since then I never stop searching the net to see if I could find a contact number. Alas! I found this website. I am so happy to know that it is now available in shopwise- Dude, and dudette- try this pastry and you will ask for more!!!! What kind of shortening do pastel of camiguin use?! Was is vegetable or lard.. Reply asap please.. Thanks in advance..
What kind of shortening do pastel of camiguin use?! Was it vegetable or lard.. Reply asap please.. Thanks in advance..
You can now buy pastel in manila at LRT Gil Puyat(Buendia) station. Beside Atrium Hotel and accross JAC Liner.